My thanks go out to Steve and Timi at MX Books for my reading copy! May, 1896. 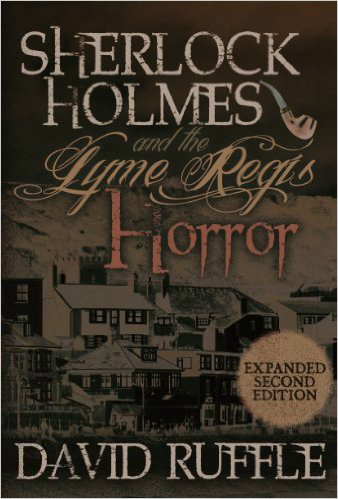 Doctor Watson has been invited to Lyme Regis, a coastal town in West Dorset, England by a friend from his university days. To his delight and surprise, Sherlock Holmes agrees to accompany him. Upon arrival, Doctor Godfrey Jacobs reveals that this is more than a friendly visit. There is a dark mystery in this sleepy little town, and Jacobs hopes that Holmes can solve it. It began when a schooner was blown into the harbor on a freak storm. When the locals went to check on it, it was found to have no one on board. There are three long crates floating in the water. These are salvaged, and the men return to shore. The ship vanishes in the night without flotsam or jetsam remaining. The expanded version includes eleven short stories. They vary in length, but I think they will be of interest to any Holmes aficionado. There is the trumpet player who is afraid of being kidnapped, a problem at Loch Ness, a possible haunting, and much more!